Hello again, I'm so glad you are visiting again. I love your company. My family will be here in a couple days and I can hardly stand the waiting. I pray all of you will spend the next few days counting your blessings and enjoying the company of family and friends. Today I am sharing another stamp camp card. I think the deer are having a fun time playing in the snow. Do any of you have snow right now. We don't, but I hear rain is coming. Okay, Dasher is the one with the fancy antlers. Doesn't he look so proud? Almost standoffish! The other deer don't seem to care. 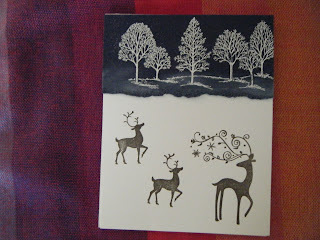 The ink colors used for this card are versamark with white embossing powder; and Suede for the deer. I like the way Night of Navy paper looks with Whisper White paper. So striking. Just like a tuxedo. Where did that idea come from? Did you check out the fabulous deals I told you about yesterday? Deals like this don't happen often. Don't miss out. I love shopping sales! Guess what I pan for Friday? I will be back with more cards next week. Have a blessed rest of the week. Save me some pie. Stay warm and God bless. Beautiful card, Gloria! Happy Thanksgiving. I pray your day will be filled with the love of family and gratitude to God all day long! Love the row of trees across the top and the deer in the lower portion - great design! Love your winter scene holiday card! You did a fabulous job combining those two stamp sets. Gloria, I also like how you combined the stamp sets. Very inspirational! Thanks for sharing! I like how you created your scene with some simple stamping and a torn piece of paper. Very clever!! this is a wonderful creation, I love it. Now following you from SC.